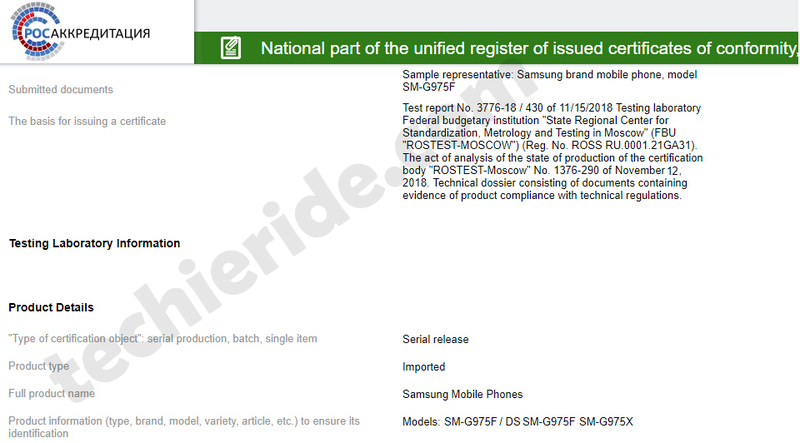 Samsung’s upcoming flagship device, Galaxy S10 has recently received certificate from the Russian site, Rosaccredit. Two variants namely, SM-G975F and SM-G975F/DS have gained the certification. The SM-G975F model will be a single SIM device, while the DS version will support dual SIM cards. Earlier, three different models – SM-G970F, SM-G973F and SM-G975F were spotted. The recently certified model could be the top end variant of the Galaxy S10. In the past, several reports and rumours about the upcoming smartphone have surfaced online. Some reports claim it to have a ceramic back instead of using a glass back. launched in Black, White, Yellow and Green colour variants. Another interesting feature of the Samsung Galaxy S10 is the in-display fingerprint scanner. If this becomes the reality, it will be the first one for the company. The Samsung’s 2019 flagship smartphone will be powered by Exynos 9820 or Snapdragon 8150 chipset accompanied with 8GB RAM.